Bang bang chicken or chicken in bang bang style, a classic chicken dish coming from the Sichuan province of China. The peculiar name “Bang Bang” is given to it due to its preparation method. 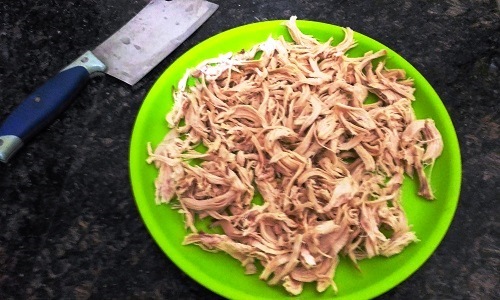 The chicken breast is beaten with a mallet to break the chicken fiber before shredding, this process breaks the fiber and allows the flavor from the sauce to enter the chicken meat during the further cooking process. The sound of “bang” which comes during the beating process is what gives this dish a name. The beating process not only gives the name to the dish but also loosens the chicken fiber which absorbs the juices from the sauce making the meat moist and flavorful. Modern chef though avoid this process, but the importance of this method cannot be ignored. Some chef prefer steamed chicken over poached as the meat is tenderer. 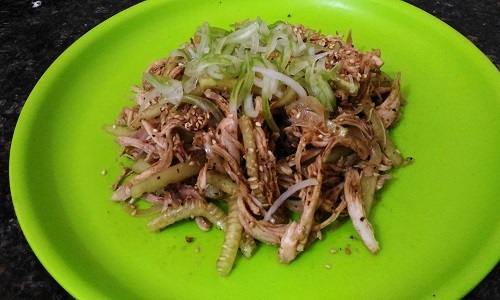 Bang bang chicken is a cold dish and is considered as appetizer, if often goes by the name of “Bang Bang Ji Si”. Today we will learn the traditional recipe for preparing bang bang chicken at home. Chicken Breast —————————————————- ½ kg. Cucumber Jardiniere Cut ————————————— 1 no. White Sesame Seed for Garnish —————————- 2 tbsp. Scallions Shredded ——————————————— 2 tbsp. Soy Sauce ——————————————————– 2 tbsp. Ground Sichuan Pepper ————————————— ¼ tsp. White Sesame Seed ——————————————– 1 tsp. Sesame Oil ——————————————————- 2 tbsp. Granulated Sugar ———————————————— 1 tsp. Red Chili Oil ——————————————————- 1 tsp. Black Chinese Vinegar —————————————- 2 tbsp. Bring the water to boil in a wok, add the chicken to it, reduce the heat, cover with a lid and cook for 30 minutes. Once the chicken is done, remove it from the wok and transfer to bowl of cold water for at least an hour to cool it before shredding. Drain the chicken pieces from the water and pat it dry with a paper towel, debone the chicken if it’s not a boneless. Place the on the chopping board and pound it with a mallet or rolling pin. Finally tear the meat into shreds using a fork or by your hand, I prefer hand. Arrange the chicken with the cucumber in a serving plate and keep it aside. 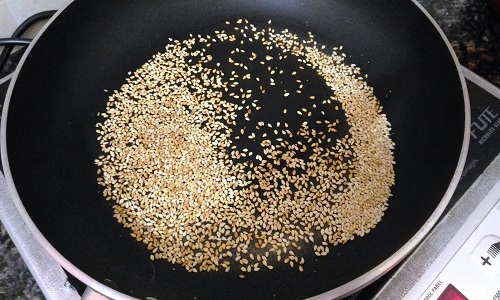 In a wok, dry roast the sesame seed until they turn golden brown, grind it to a paste and keep it aside. In a bowl mix the sauce ingredients by stirring constantly i.e. soy sauce, sugar, vinegar, pepper and sesame paste. Add the sesame oil and chili oil by whisking to attain a emulsified texture. Mix the chicken with the shredded scallions. Top it with the emulsified sauce and garnish with sesame seed. 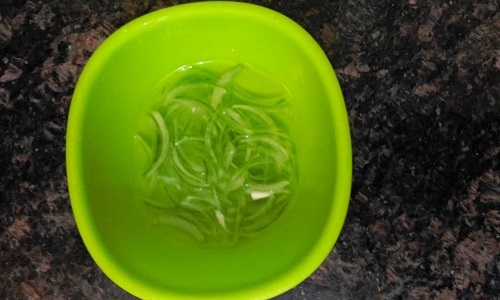 Keep the scallion in ice water after shredding so that it is crispy and curly. Whisk the oils properly so that the desired texture is obtained. This can be served with thread noodles. Black roasted sesame seeds can also be used for garnish. You can add the herbs while boiling chicken and avoid the beating process.